If youÂre lucky, when you next visit Ambergris Caye you may catch a glimpse of Brandi, the Isla BonitaÂs local mermaid. Â Such was our luck when we attended the latest Saga Society cook off in San Pedro. There were more than enough scrumptious tidbits to make a complete meal. What the Heck is Nyotaimori? So we were all surprised and amused to walk into the open bar, over the sea, to find local mermaid, Brandi, reclining on a serving table covered - and surrounded by - scrumptious sushi treats.Â Sushi Sharon had intricately placed her colorful sushi tidbits artistically on and around Â Mermaid BrandiÂs body.Â . Â But it was still a highly unusual and whimsical sight to behold at a funky beach bar in San Pedro Town, Ambergris Caye. This was edible art worth an indulgence.Â Needless to say, one of the mermaid delicacies took the first prize! Was it the sushi, or the fact that it was served on BrandiÂs mermaid body, that resulted in the prize?Â WhoÂs to say?Â Either way, it was an entertaining evening and a daring way to serve food. 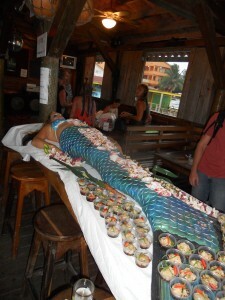 Have you been seeking ways to incorporate a Âwow factorÂ into a special bash on Ambergris Caye?Â Sushi Sharon and Mermaid Brandi are available to attend special events and parties.Â You could really impress your friends with this edible art presentation, served up on a live Ambergris Caye mermaid!